that will be needed for this section on Equations. 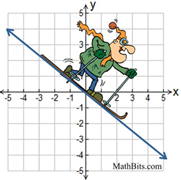 The slope of a line, m, is a rate of change which is constant in linear equations. 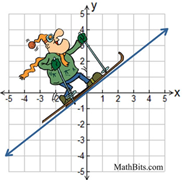 Slopes may be positive, negative, zero, or undefined(does not exist). Lines that have positive slope, rise from the lower left to the upper right on the axes. They go "up hill". Lines that have negative slope, decline from the upper left to the lower right on the axes. They go "down hill". Lines that are horizontal have a slope of zero. Lines that are vertical have no slope (undefined slope). Use this form when you know, or can find, the slope, m, and the y-intercept, b. Use this form when you know, or can find, a point on the line (x1, y1), and the slope, m.
The A and B values in this form cannot be zero. Use when asked to state the answer in Standard Form. May also be Ax + By - C = 0. Note: The equation of the x-axis is y = 0. Lines that are vertical have no slope (it does not exist, undefined). They have "rise", but no "run". The rise/run formula for slope always has a zero denominator and is undefined. Every point on this line has an x-value of -5. Note: The equation of the y-axis is x = 0. • Lines that are parallel have equal slopes. • Lines that are perpendicular have negative reciprocal slopes. 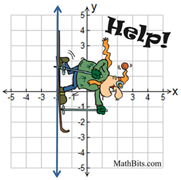 Here are a few of the more common types of problems involving the equations of lines. 1. Find the slope and y-intercept of the equation 2y = 8x - 11. Solution: First, solve for "y =". The slope, m, is 4. The y-intercept, b, is -5.5. 2. 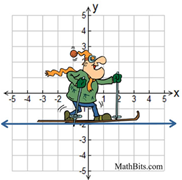 Find the equation of a line whose slope is -2 and who crosses the y-axis at (0,-3). Solution: The m = -2 and b = -3. 3. Find the equation of a line whose slope is 4 and passes through the point (-3,5). Solution: The m = 4 and (x1, y1) = (-3,5). 4. Find the equation of a line passing through the points (-2,6) and (-4,-2). Use either point as (x1, y1): (-2,6). 5. Find the equation of a line that is parallel to the line y = -2x + 8 and passes through the point (3,6). Solution: Parallel means equal slopes. So, m = -2 and (x1, y1) = (3,6). 6. Find the equation of a line that is perpendicular to the line y = x + 7 and has the same y-intercept as 3y = 2x - 9. State the answer in Standard Form. Solution: Perpendicular means negative reciprocal slopes. So, m = -1 and b = -3.